Interest in improving the microstructure in power plant steels stems from the 1970’s where there was a considerable drive to improve and increase the ability of the stream circuit to handle higher pressures and higher temperatures. Some key work in uncovered the possibility to remarkably improve the stress rupture strength by the addition or increase of some key inclusions such as vanadium, niobium and tungsten to name but a few. The development of the family of 9-12%Cr martensitic steels for power generation components has been a significant feature in the 1980s. However, the basic compositions of 9Cr1Mo have been widely used for many years. The driving force for new developments has been the need to increase the temperature and pressure of the stream circuit. In the 1970s, there was considerable interest in the 9% chromium steels for components of the fast breeder nuclear reactor. On the basis of the familiar Fe9Cr1Mo steel used since the 1950s in petrochemical plant, an improved steel was developed by the Oak Ridge National Laboratory and subsequently incorporated into the ASTM specifications under the designation P91 (ASTM 1986). A remarkable increase in the stress rupture strength was achieved by the addition of 0.2% V, 0.06 Nb and 0.05 N. In Japan, a steel development programme of Nippon Steel led to the steel NF616 (Nippon Steel 1991), which is now designated P92 in the ASTM specification. With P92 a further increase in stress rupture strength was obtained by an addition of 1.8% W and a reduction of the Mo content from 1 to 0.5%. In the European COST (Co-operation in Science and Technology) Action 501, a similar 9% chromium steel was developed; this steel is designated E911, contains 1% Mo and 1% W, and offers similar stress rupture strength to P92. Although much of the work described was carried out on the steel P92, the findings are in principle also applicable to P91 and E911. The essential difference between the steels is the tungsten content and with increasing tungsten the propensity for Laves phase Fe2(Mo,W) formation increases. In the last two decades, a number of new 9–12%Cr steels with improved creep strength have been developed for long-term service at temperatures up to 600°C and above in high-temperature parts of boilers, steam lines and turbines of ultra-supercritical power plants. For the long-term application of the new steels, it is necessary to assess the microstructural changes that are likely to occur during service exposure and to evaluate the effect of such changes on the high temperature creep behavior. Only with this information can the design values for components be correctly assigned. 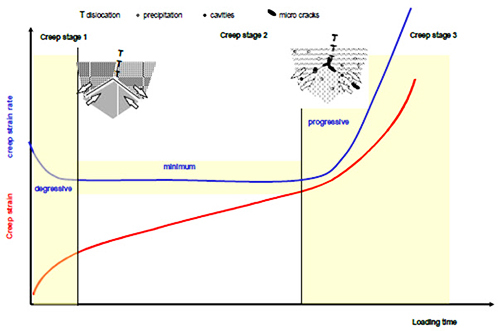 If the components are operated in the creep range, the behavior as shown on Figure 1, showing the dependency between plastic creep deformation and damage can be observed. During the phase of primary creep, the creep strain rate decreases, and the main cause of this phenomenon is seen in the increase of density of dislocations in the material. In the phase of secondary creep, a balance of hardening and softening mechanisms is present; therefore the creep strain rate is almost constant. Aside from changes in the micro structure like formation of precipitates, other thermally activated processes in the microstructure can take place like: pearlite decomposition, coagulation and precipitation of carbides etc. These processes are independent from material, time and temperature. All the changes in the microstructure up to this point are reversible, and their effects can be mitigated through i.e. heat treatment. Irreversible creep damage appears in the form of cavities, dependent on material and load (stress, temperature and time). In connection with the metallurgical changes (sub-grain growth, particle coarsening and increase of particle distances), the creep strain rate increases significantly. As the damage progresses, chains of cavities appear mostly on the grain boundaries, as well as micro cracks. They tend to grow in the direction of load. This phase is known as tertiary creep phase. The optical-microscope visible damage in the form of creep cavities is dependent on type of material and its microstructure, temperature and load (stress and multi-axiality). Multi-axiality of the load reduces the deformability of the material, therefore promoting the cavitations processes.